What Is Couscous, and Why Should It Be in Your Pantry? You can learn a lot about a culture from its cuisine. In fact, certain foods are so influential in their region of origin that they’re almost synonymous with that location. Consider the importance of curry in India and Thailand, pasta in Italy, and spicy jambalaya in New Orleans. Couscous is another of these culturally significant staple foods, but this one is native to North Africa. More specifically, it’s popular in the Maghreb, a region made up of nations like Libya, Tunisia, Algeria, and Morocco. If you travel to any of these beautiful countries, you’ll have access to some of the best couscous in the world, but the question remains: What is couscous? Read on to discover all the delicious details. First, we should probably define what couscous isn’t. Contrary to its appearance, texture, and taste, couscous is not a type of rice. In fact, it’s actually more closely related to pasta, which might explain why it enjoys some popularity outside of Africa on the island of Sicily. Couscous is made from semolina, the same wheat flour used to make pasta. This is why, despite its rice-like appearance, couscous is actually much fluffier than rice. In the Maghreb region, couscous is usually served with vegetables like carrots or potatoes. It can also be mixed in a mild or spicy stew with meats such as mutton or lamb. In Egypt, it’s even commonly enjoyed as a dessert, mixed with ingredients like butter, sugar, and cinnamon. The origins of couscous are unknown, but some historians believe that it dates back more than 2000 years. Archaeologists have unearthed ancient pots in Algeria that appear to have been used for making couscous. Long before it was made with wheat, it was made with millet, a type of cereal plant. One of the best things about couscous—aside from the delicious taste—is its nutritional value. A single cup of cooked couscous will have about 190 calories, two grams of fiber, and seven grams of healthy vegan protein. Couscous is naturally free of sugar and fat and is rich in selenium, which may aid in the prevention of heart disease. 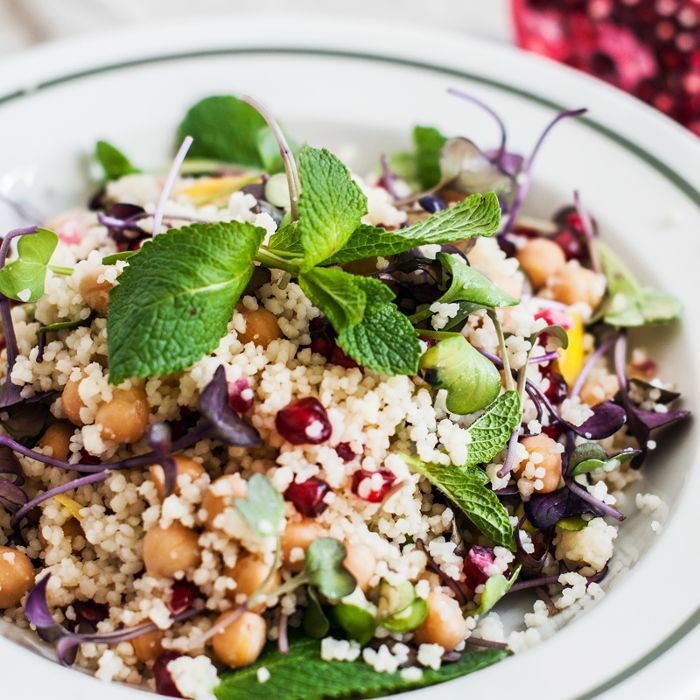 For the truly health-conscious, opt for whole-wheat couscous. Regular couscous has a higher-than-average glycemic load, so people with diabetes should exercise caution. Although couscous is known as the “national dish” of North Africa, it enjoys worldwide popularity. If you purchase dry couscous at your local supermarket, you can easily prepare the dish at home. You just need a saucepan, some olive oil, and a bit of salt. Pour water into a saucepan and bring to a boil. Use 1 1/2 cups of water for each cup of couscous you plan to prepare. Add 1/2 teaspoon of salt and a splash of olive oil. Pour couscous into the saucepan, stir well, and cover until the couscous reaches the desired consistency. Drain water, and enjoy. Couscous goes great with meat and veggies, so feel free to mix it with all your favorites for a well-rounded meal. If you decide you love it, read on for our list of healthy, weight loss-friendly recipes, including an irresistible fried egg and cabbage couscous bowl. What Is Polenta Made From, Anyway? Wild vs. Farmed Fish: What's the Difference? What Is Miso—and Is It Healthy?